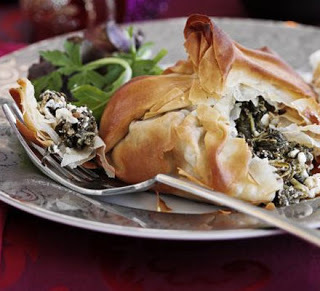 This Middle Eastern vegetarian triangular parcel, are based on a Lebanese recipe speciality called fatayer. You could serve this as part of a mezze with olives, crusty bread and hummus or on its own as a lunch or side dish. Serve with fresh crisp salad leaves for dinner. Heat the oven to 190C/fan 170C/gas 5. Wilt the spinach in a little butter, then cool, squeeze out any water and chop. Put in a bowl with the cinnamon, 1 tsp of the cumin, feta and walnuts and season really well. Melt 50g butter in a small pan. Cut the filo sheets in half so you have 18 squareish pieces. Butter 3 sheets on both sides, then lay on top of each other with each one at an angle to make a rough star shape. Put 1⁄6 of the filling in the middle. Bring up the sides and gather together at the top, squeeze or twist to seal firmly. Repeat with the other 5. Bake for 20-25 minutes until golden and crisp. Mix the yogurt and garlic with the other ½ tsp cumin seeds. Serve with a dollop of yogurt and a few salad leaves. Drizzle over a little pomegranate molasses to finish, if you like.